We’re slowly losing count of the number of Egyptian-themed online slot machines we’ve played and reviewed but that certainly doesn’t mean that another one is not welcome. Temptation Queen is based on ancient Egypt and the queen in question could be Cleopatra, Nefertiti or one of many others but that doesn’t really matter – the theme is Egyptian. 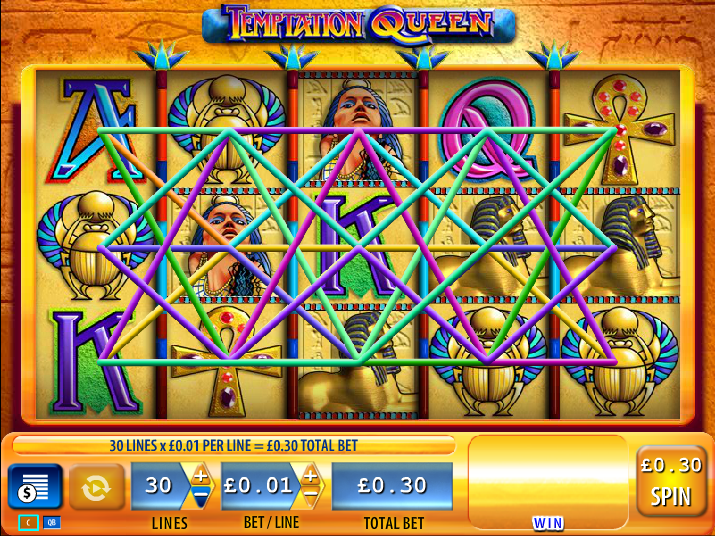 Temptation Queen is slot which features five reels and a possible thirty paylines; the backdrop to the reels is a stone wall adorned with hieroglyphics. The more valuable symbols are what we expect from a slot related to Egypt and we have a Scarab, an Ankh, a gold Falcon and a gold Sphinx as well as the Queen herself. The wild symbol is the rising sun behind a pyramid and the scatter symbol which triggers the free spins is a golden statue of a cat. This feature can be quite profitable and that’s because every time a wild is part of a winning payline in the base game it will expand to cover all the places on that reel. This provides the player with lots more winning opportunities. The wild symbols only appears on reels two, three and four but it’s possible to land two or three at once, further increasing your winning chances. Eight free spins are up for grabs in Temptation Queen and you can help yourself to them by landing three, four or five of the golden cat scatter symbols on adjacent reels starting with reel one. The wild symbol helps again here because unlike most slots it can substitute for the scatter. You’ll get an eyeful of the nearly-naked queen and then all you need to do is click the ‘Start Feature’ button to spin the reels. Wilds also expand in the bonus game as they do in the base game. This is probably not the best of the Egyptian slots games but it’s not bad either; the free spins round is fairly run-of-the-mill but the expanding wild adds plenty of money-making action to the base game.